Curators Shannon Stratton and Jeff M. Ward describe “Ps & Qs” as “surprisingly friendly formalism,” an exhibition of new works that flirt with the stringency of 20th century formalism, but give it a contemporary, 21st century twist. These are often playful works, which are indeed far more intimate and “friendly” than the canonical mid-century work associated with Clement Greenberg: they are colorful, relish their materialism, and resist the hard-edged perfectionism we tend to associate with Piet Mondrian and Le Corbusier’s designs. “Ps & Qs” was first shown in the Glassell School of Art (Houston) in 2006. The Hyde Park iteration of the show is hardly a repeat of Houston, though; Todd Chilton, Katy Heinlein and Andrea Myers are the only artists carried over from the 2006 exhibition, but they and the four artists joining them here in Chicago (Peter Fagundo, Carrie Gundersdorf, Jessica Labatte and Tessa Windt) all created new work for Hyde Park. In doing so, each artist tackles the idea of formalism in different ways. Some, like Gundersdorf and Chilton, take a rather traditional approach, using oil paint and colored pencils. 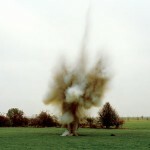 Others, like Heinlein and Fagundo, craft evocative sculptures from Spandex and Styrofoam that simultaneously call to mind Robert Morris’ anti-form piles, Robert Smithson’s non-sites, and Eva Hesse’s work in latex, papier mâché and wood; however, they renounce the monumentality of those earlier works in favor of a humbler, almost pathetic approach. Lest you think I mean pathetic as a criticism, let me explain: Fagundo’s sculptures take the form of rectangular boxes, positioned below eye-level, packed with cubes and rectangular solids made from muddy-colored Styrofoam. They are placed at knee height so that one has to kneel to look at them. They are charming and mysterious objects that possess more than a little sadness. Nearby, Heinlein’s stretched and wrapped spandex forms suggest other, harder objects hiding beneath, afraid to peek around the curtain. The peeking, shy nature of these works is emphasized by Stratton and Ward’s exhibition design, which makes smart use of the small Gallery 4 on the second floor of the Art Center. 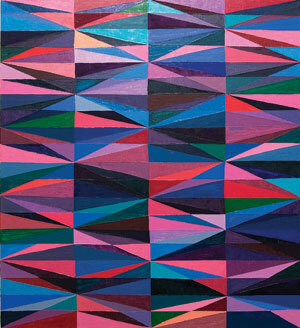 Todd Chilton’s geometric oil paintings, characterized by their complex patterns, bold colors and almost childlike handling of paint, hide from one another on either side of a small wall. The viewer is forced to play a quick game of hide and seek to investigate the relationship between Purply Diamonds and its black-and-white brother, while Heilein and Windt’s wall-hung fabric sculptures billow out into space like improbable sails. In sum, “Ps & Qs” is a beautiful show, even if it is more of a shy stranger than a friendly acquaintance. 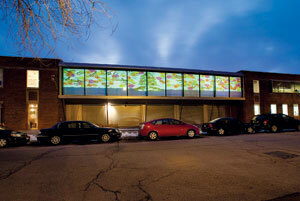 Notes to Nonself video projection, Installation view from street. Photo by Tom Van Eynde. Also at the Hyde Park Art Center, “Notes to Nonself” is a whimsical environment created by Diane Christiansen and Shoshanna Utchenik. 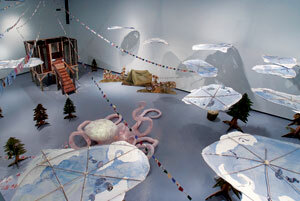 The exhibition is like a stage set: the viewer enters the large, ground-floor Gallery 1 through red curtains, finding a room that is filled with a forest of plywood trees, swirling papier mâché clouds suspended from the ceiling, and various other objects reminiscent of the fantasies and nightmares of childhood. The artists ask the viewer to embark on a meditative journey through different areas of the gallery, which are titled with evocative names like Ego Forest, Relationship Bardo, Temporary Refuge and Teacher Garden, and the Meditation Clubhouse. Presiding over this dream-like landscape is an animated film by Diane Christensen (with Shelly Dodson and Matt Marsden as additional collaborators) projected on the second floor catwalk gallery. Christiansen and Utchenik’s world is quaint and pleasant. The trees are hung heavily with handmade prayer flags, while a giant papier mâché octopus holds court halfway through the exhibition. Next, a flat pup tent that suggests but ultimately denies refuge coyly awaits the viewer; and a human-scale clubhouse filled with meditation pillows dominates the far corner of the room, providing an elevated vantage point from which to watch other viewers wander through this allegorical fantasy. Upon closer inspection of the prayer flags, one discovers that they are made up of notes between the artists, and euphemistic declarations like: “make something new every day.” These meditative, therapeutic messages speak to the artists’ interpretation of the eight Dharmas of Tibetan Buddhism: the path through the space is intended to be a movement from a cluttered mind to a clear one. However, while traversing “Notes to the Nonself” is indeed calm and rewarding, the experience is not one of clearing the mind. There is too much to investigate here to find oneself emptied completely. In the afternoon, Christiansen’s animated video (with a soundtrack composed by Steve Dawson) plays in the catwalk gallery, like an animated vision of a bizarre, celestial world that hovers above the gallery below. The animation illustrates the life-cycle of a tree that moves from an industrial dump, through water, and to a deserted island where it emanates flowers and other miscellaneous items. Like the installation, the video depicts a journey with an uncertain end, a journey where the voyage itself is more important than the destination.